After getting accepted into UCLA, Peyton Aaronson was so emotional over the phone that her mom thought she’d been in a car accident. 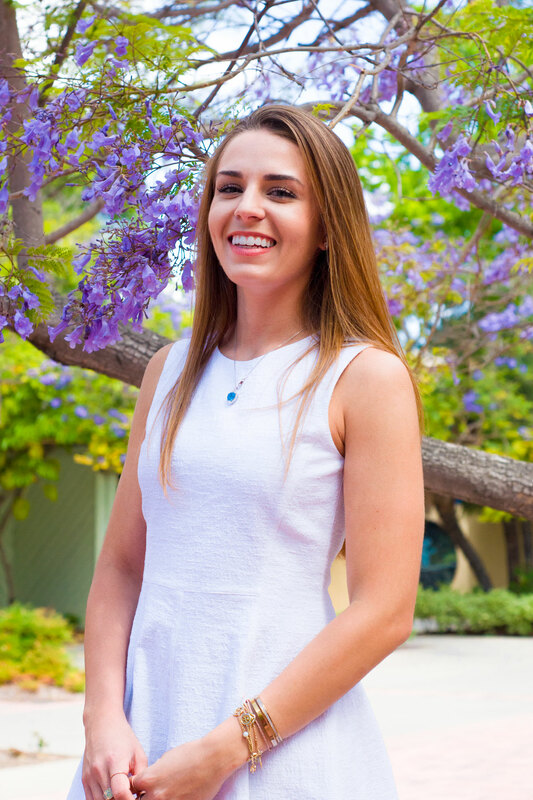 Throughout her four years at UCLA, Aaronson has worked as an Athletic Peer Learning Facilitator, Bruin Belles volunteer and Mortar Board National Honor Society leader. Though she’s planning to apply for veterinary school next year, she wants to be a well-rounded person involved in communities outside of animal medicine, she said. She said it was surreal to attend UCLA because she’d built it up in her mind since sophomore year of high school, when she wrote a letter to her senior self, hoping she would be a Bruin. Her college acceptance made her emotional in part because she wanted to make her dad proud; he was diagnosed with a condition that needed treatment during Aaronson’s senior year of high school. The future was ambiguous. She travelled home two or three times a month during her first year of college to spend time with her dad. Bonding over their love for food, Aaronson and her father went out to eat or watched Food Network together. She shared every detail of her college experience so he would he feel like he was there with her. She hoped that relaying her memories to him would take his mind off his condition, but the time spent away from campus was academically challenging since she couldn’t study in the library. Realizing that striving to succeed in school would make her family most happy, she decided to do more on campus. At the activities fair her second year, she joined Bruin Belles Service Association. She volunteered at Play Day, where kids from the Boys and Girls Club play with student athletes to encourage the kids to come to college; Dress for Success, which invites underrepresented youth to buy designer dresses at discounted prices; and the Ace of Hearts foundation that hosts dog adoption events. That’s when Aaronson started thinking about working as a vet. She grew up around medicine with her dad, who is a plastic surgeon, and her mom, who is a respiratory therapist. However, they advised her not to pursue medicine, Aaronson said. Still she had an inclination towards animal medicine. Even at age six she would sort her dad’s slides of dog bite victims. Visiting lions at the zoo near her Palm Springs home became her favorite pastime. In 2015, she worked at a pet emergency room in San Diego. Her first day on the job was an at-home dog euthanasia. Another day, someone brought a cat in a big metal cage to the back of the ER. The stitches of its spay had come undone, and its intestines were outside of its body stuck to the cage. She realized if she could enjoy the extreme side of veterinary medicine she could handle working as a vet. However, Aaronson didn’t want to just focus solely on medicine during college, so she built communities that allowed her to become well rounded, she said. Through Bruin Belles, she heard about her job as a Peer Learning Facilitator, where she teaches students athletes and sees a different aspect of a UCLA education. Her job led her to Mortar Board to gain leadership experience as the Director of Communications Chair. Conducting research at the David Geffen School of Medicine about exercise motivated her to go to the gym daily and relieve her stress through running — her research was published in the May issue of Shape Magazine. She joined these organizations to get the most out of her time at UCLA after her family motivated her to get involved; now she is grateful for her support systems in these organizations — her mentors, bosses, friends and her mom and dad, who found a medication to improve his condition. After graduation Aaronson is moving to San Diego to take a gap year to apply for veterinary school in fall 2017. She’s been reflecting on her time in college embracing different communities on campus, and said UCLA has surpassed the expectations set by her high school self.